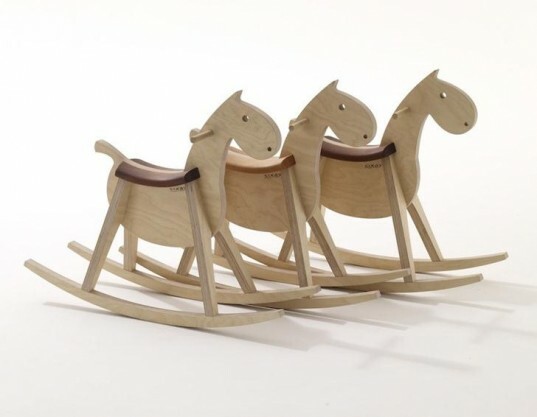 New in the world of rocking horses is the breathtaking, beautifully designed wooden rocking horse from Beck to Nature. 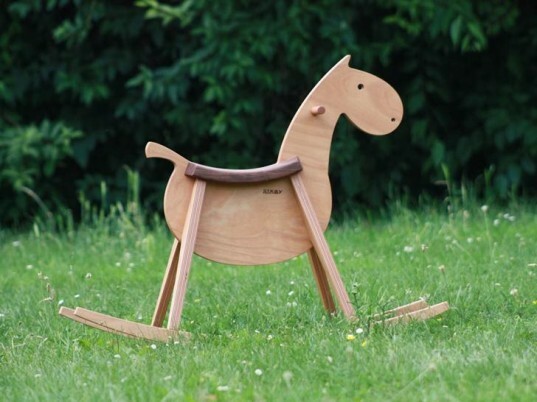 Not only gorgeous, this rocking horse is eco-friendly and safe too. Read on to learn more. A decent rocking horse, or other rocking toy is a must-have for every kid. Rocking toys are perfectly fun both indoors and out, plus they help children develop proper balance and work on skills (like holding on) that they’ll need for bike riding. Of course, a sweet rocking horse also works your child’s imagination. Your little one can storm off to save a castle or simply pretend to ride the range. The Beck to Nature rocking horse is heirloom quality, sure to be passed down for generations. Made with lovely and modern safe and smooth lines, the unique and surprising style means it fits in anywhere in the home – you won’t have to hide this rocker away. The horse is ergonomically shaped for children and 100% functional, with fine joinery and no loose pieces for a safe and enjoyable ride for little ones. 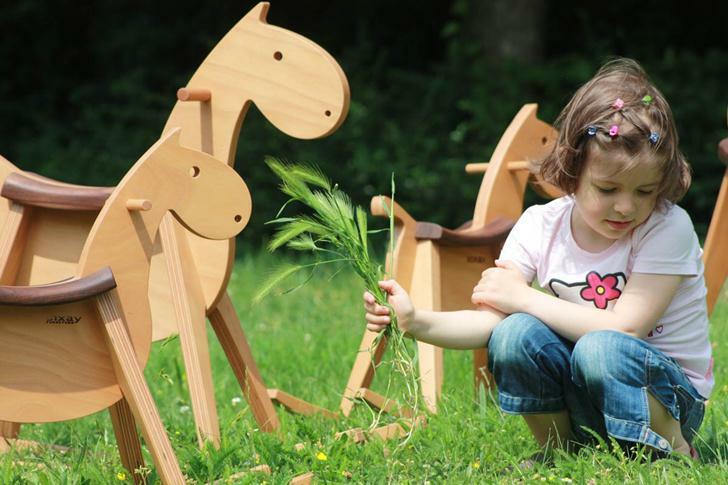 This rocking horse is made with natural wood, although what we’d most like to see is FSC certified wood. Which this could be, but sadly Beck to Nature lacks a website, so consumers have no way of knowing their sourcing – we hate that. The surface of the horse is totally safe, left unpainted and treated only with natural materials, wax and oil. This is less toxic and means that no paint is present to wear out during usage. This sweet rocking horse comes in a mini size with a height of 21.7″ (55 cm) for smaller children and a larger size 28.3″ (72 cm) in height for bigger kiddos. The mini is recommended 2 years and up while the maxi size is recommended for kids 3.5 years and up. A decent rocking horse, or other rocking toy is a must-have for every kid. Rocking toys are perfectly fun both indoors and out, plus help children develop proper balance and work on skills (like holding on) that they'll need for bike riding. Of course, a sweet rocking horse also works your child's imagination. Your little one can storm off to save a castle or simply pretend to ride the range. The Beck to Nature rocking horse is heirloom quality, sure to be passed down for generations. Made with lovely and modern safe and smooth lines, the unique and surprising style means it fits in anywhere in the home - you won't have to hide this rocker away. 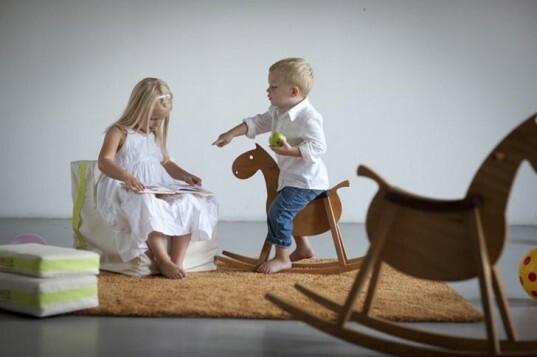 The horse is ergonomically shaped for children and 100% functional, with fine joinery and no loose pieces for a safe and enjoyable ride for little ones. 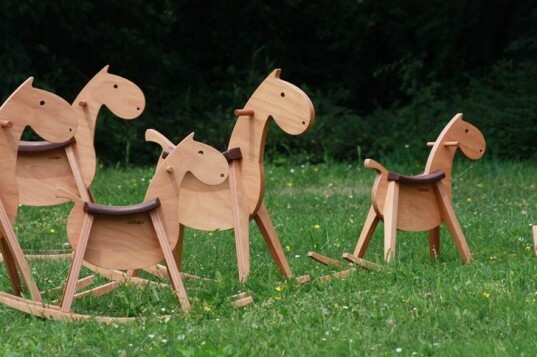 This rocking horse is made with natural wood, although what we'd most like to see is FSC certified wood. Which this could be, but sadly Beck to Nature lacks a website, so consumers have no way of knowing their sourcing - we hate that. The surface of the horse is totally safe, left unpainted and treated only with natural materials, wax and oil. This is less toxic and means that no paint is present to wear out during usage. This sweet rocking horse comes in a mini size with a height of 21.7" (55 cm) for smaller children and a larger size 28.3" (72 cm) in height for bigger kiddos. The mini is recommended 2 years and up while the maxi size is recommended for kids 3.5 years and up.